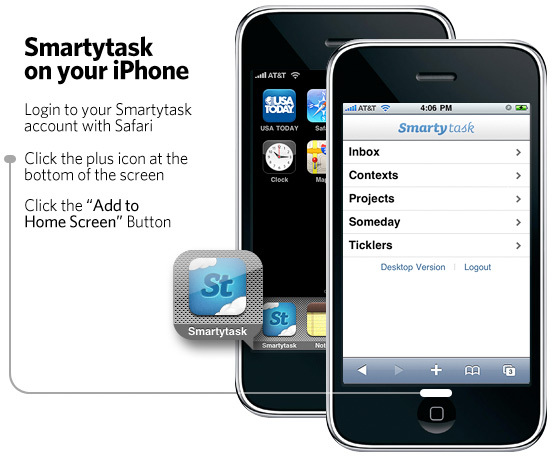 Smartytask can run on your iPhone as a web app. Unlike a native iPhone app that you would download from the app store, Smartyask will automatically activate it's iPhone app when you login through safari on your iPhone. Instructions on bookmarking are below. This will be the foundation for more devices (Android's getting the most requests), but as our first stab at mobile Smartytask features are quite limited for now. It's a reliable way to access your lists on the go, but it's not ready for heavy GTD-ing yet. Expect updates on mobile Smartyask soon.